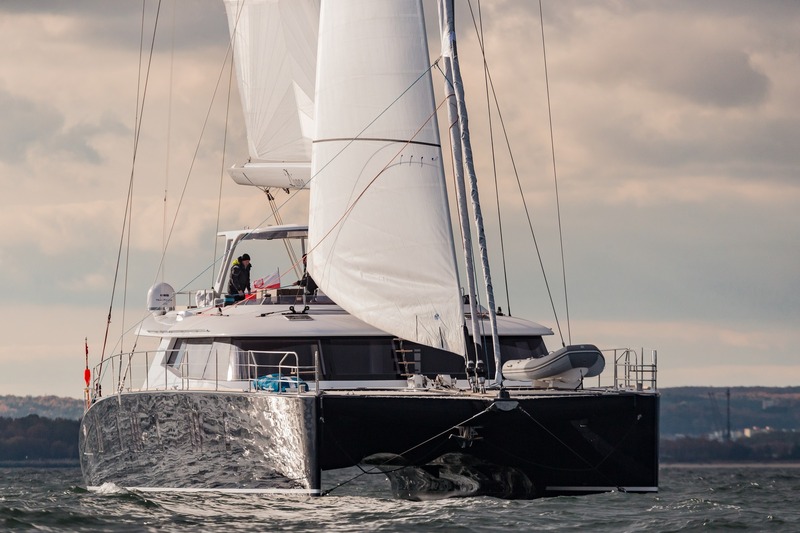 22.5m/74ft luxury catamaran ORION from Sunreef Yachts was constructed with a lightweight GRP hull and superstructure and launched in 2017. The accommodation sleeps up to eight guests over four spacious en-suite cabins, plus a single foredeck cabin suitable for a child, and a crew of four to keep everything running smoothly throughout the cruise. The main deck cockpit is a sheltered environment providing an alfresco lounging and dining area along the stern consisting of a spongy sofa and a raised table. 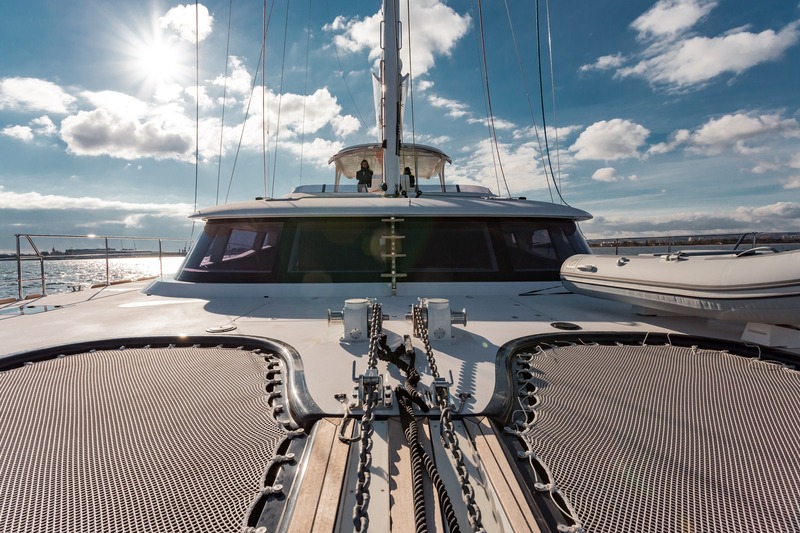 The foredeck is furnished with a pair of trampolines, and upon the flybridge, there is room behind the helm controls for sun loungers in the sunshine. 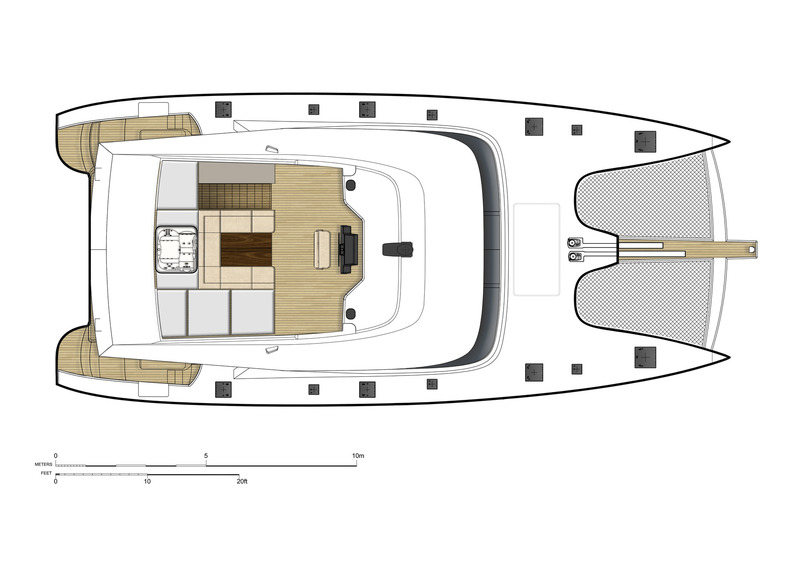 Beneath the hardtop, there is a C-shaped sofa around an alfresco dining table, with sunpads to starboard and a Jacuzzi along the stern. 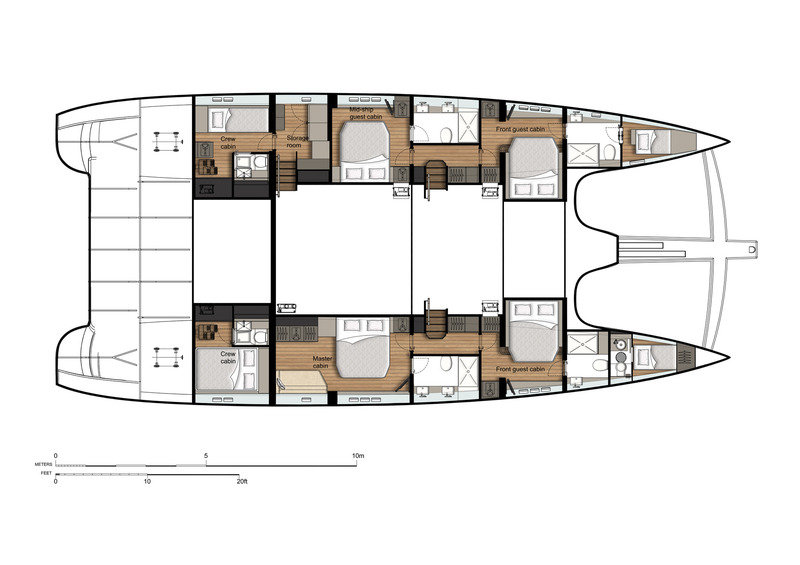 The guest and crew accommodation is placed in the port and starboard hulls, with the central area creating an open plan living and dining space. The helm station is placed forward to port with a bar to starboard. 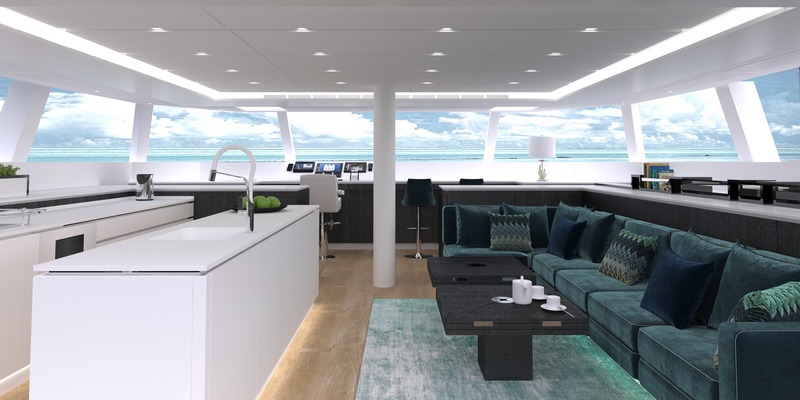 Behind, the galley is placed to port with the lounge/formal dining area opposite consisting of a large elevated table and an L-shaped sofa with additional movable chairs. Twin 225 HP John Deere engines produce a top speed of 13 knots with a cruising speed of 9 knots. 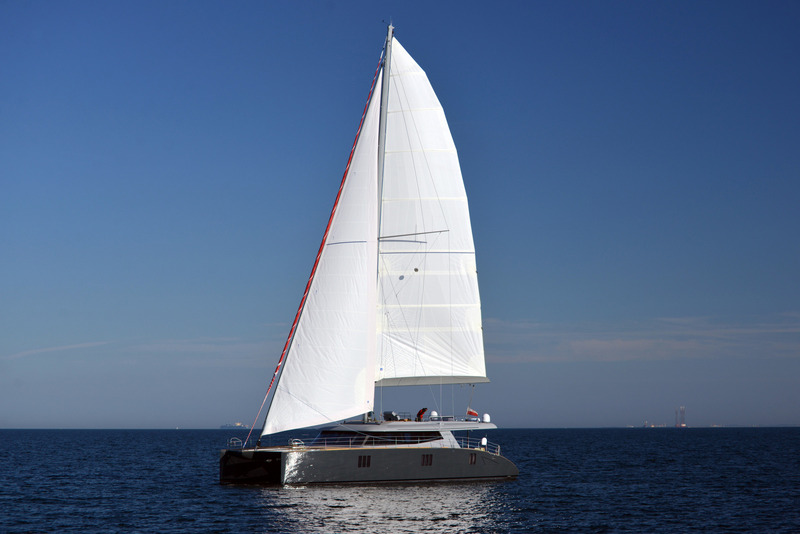 A maximum of 8 guests can be accommodated in the 4 en-suite cabins: 1 Master suite and 3 double cabins, plus one foredeck cabin suitable for a child. ~ The Master suite is placed amidships in the starboard hull and contains its own day bed along with a king-sized bed, wardrobe, widescreen TV and en-suite bathroom with two sinks, a toilet and a shower. ~ The forward starboard guest cabin has a wardrobe and set of drawers, a widescreen TV and a bathroom with a sink, toilet and shower. 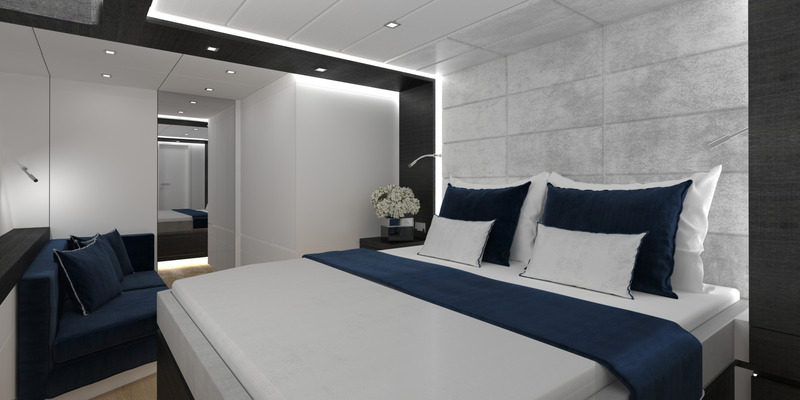 The port-side double cabins located forward and amidships also have the same amenities. 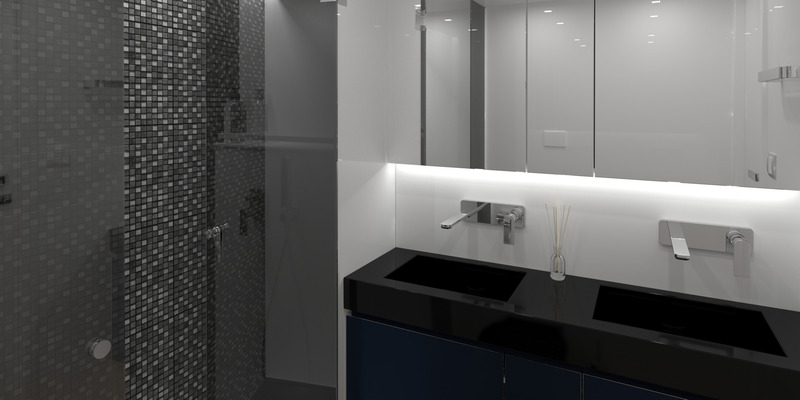 A single cabin suitable for a child is placed within the port hull and is accessed through the bathroom of the port forward double cabin. 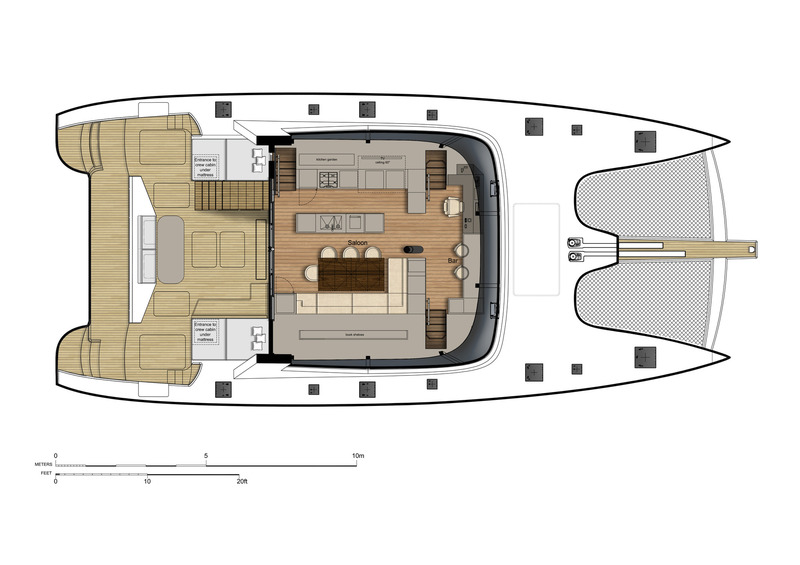 ~ The crew of 4 are accommodated in the aft of the port and starboard hulls, with an additional crew cabin in the bow of the starboard hull.